Well, I suppose I could undo this quilt, so it’s really not so fait accompli after all. The act of making it is presumably reversible. But it will remain an accomplished deed. Irreversible. How many times do we say to ourselves, I wish I could do that over. Whatever it is we did. Or: I should have done this, said that. Sometimes life gives us a second chance, but mostly not. We have no choice but to go forward, and try not to look back. No regrets. Let hope lead us on. Toward that unknown horizon. Where sea and sky meet. A line from the movie Out of Africa left echoes in my brain. It went something like this: Maybe the world was made round so we cannot see too far ahead. That is good. Let tomorrow be forever a mystery. This entry was posted in Life and tagged Life on September 17, 2013 by Irma. It’s a gorgeous quilt, Irma! I’m overawed by your talent and by how quickly you create these works of art and bring them into being. 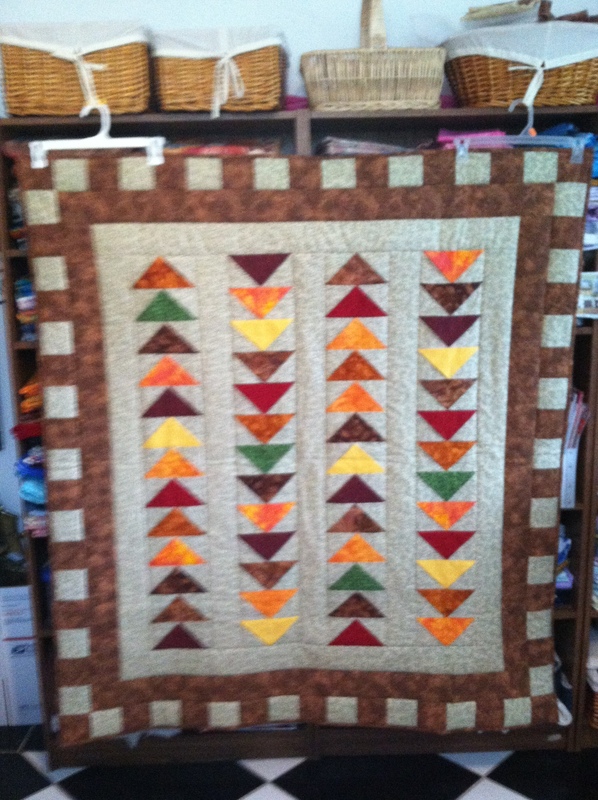 I love autumn–it’s my favorite time of year–so this quilt makes me smile. Hi, Wren. Thank you. Quilting is therapeutic. Takes my mind off things and lets me paint with fabric, instead of words.